Box Review 2019: Is Box a Good Hosting? Box is an Israeli-based web hosting solution, offering affordable hosting and domain registration services for small and medium-sized businesses. Box offers many basic hosting features, including FTP and email acocunts, MySQL databases, website statistics, and a one-click installer. Upgrading your plan provides you with additional disk space and email accounts. Founded in 1995, Box is an Israel-based web hosting company that provides affordable hosting and domain registration services for the Israeli community, whether at home or abroad. Their plans and services are suitable for small businesses and medium-sized companies. Box supports a good number of third party applications and add-ons, such as extra domains and emails, in addition to SSL certificates. To unlock more features, such as disk space or email accounts, I recommend that you upgrade from the basic plan to any of the premium ones. If you’re interested in building a website that will rank highly for Hebrew search terms, Box would be a good choice. You can take advantage of their Israeli IPs and free web metric tools to get ahead of your competition. The Box website is easy on the eyes. Plans and pricing are clearly laid out. I used Google translate to check the features and compare prices. I found the userinterface very convenient, with great functionality, but I wish they had an English version of the website for international customers. Box.co.il, like many hosting companies, offers four flexible plans thatcatertothe needs of Hebrew-speaking professionals and the Israeli business community. 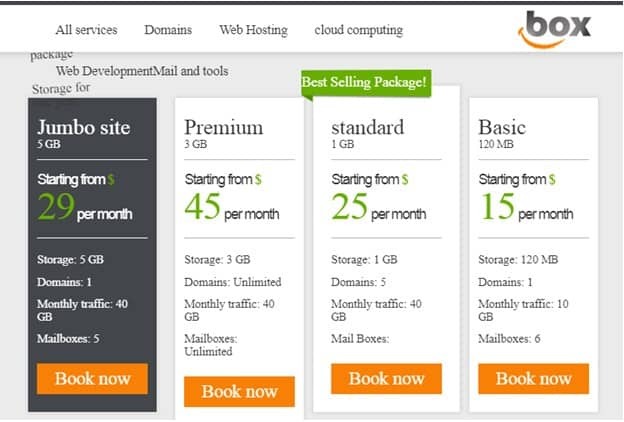 The first package is the Basic plan with 120MB storage, 1 domain, 10GB monthly traffic, and 6 mailboxes. If you want to setup a basicwebsite, this plan should suffice. Standard plan is the second package. Feature-wise, it’s not very different from the Basic plan. With this plan, you get 1GB storage, 5 domains, and 40GB monthly traffic,plus unlimited mailboxes.The third plan is referred to as Premium. With it, you get 3GB storage, 40GB monthly traffic, and unlimited mailboxes. The Jumbo plan winds up the list. The plan comes with 5GB storage, five mail boxes, 40GB traffic bandwidth, and one domain. Box offers three channels of support: phone, email, and live chat in Hebrew. You can also reach them on Facebook, though it’s not listed as a support channel. I found two telephone numbers on the website. I guess one is for technical support and the other one is for inquiries. I did contact the Box customer support team via email and got a response with 2 hours. They come across as genuinely helpful. You can count on them to answer your questions promptly and resolve any technical hosting problems to your satisfaction. If you’re looking for a good hosting company that understands the needs of Hebrew-speaking customers, Box.co.il is a great option. It offers customers flexible hosting packages with robust features and timely support. Wondering how Box stacks up against other Web Hosting companies? Enter any other Web Hosting company and we will give you a side-by-side comparison.